Royal Society of Marine Artists' annual open exhibition in October 2018. This will be the fourth consecutive year I have had work on display at this prestigious exhibition. is now featuring on their website and in their promotional material. I started to paint about 16 years ago during odd holidays by the Cornish coast, but it was not until we moved to Rock in 2011 that I began to work in earnest. Now, immersed in my new life by the sea, walking the glorious coastline and sailing in the beautiful Camel Estuary, I am constantly inspired to evoke on canvas the sights and sounds of this wonderful landscape. 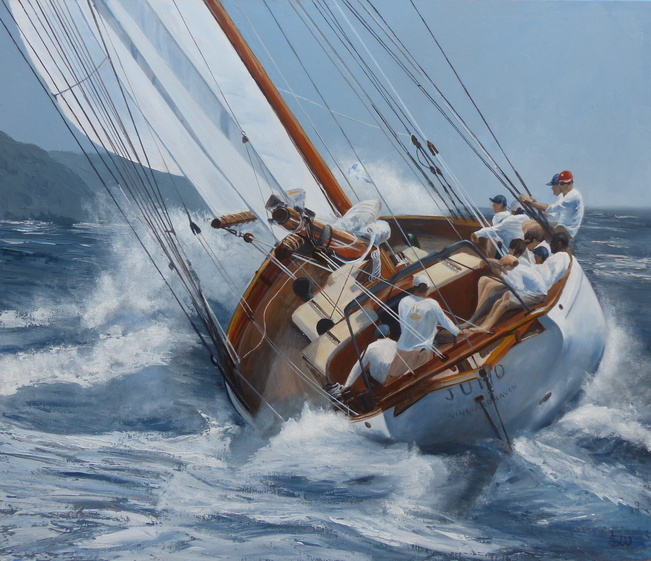 Boats afloat, particularly classic yachts, and usually in full sail, are now my favourite subject - trying to capture the excitement and power of wind-filled sails, the grace of a heeling hull and the sound of a surging bow-wave becomes a totally absorbing and often exhilarating task.